From constipation and diarrhea to heartburn and hernias, digestive disorders cover a wide range of medical conditions affecting millions of people everyday. 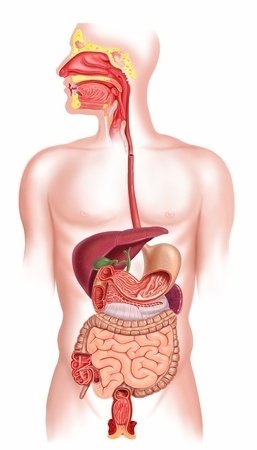 The human digestive tract is made up of many different organs that do many different things, and when things go awry in this system it's usually never a pleasant situation. Our digestive system is our biggest port of entry into the human body, so it's important we take care of it as best we can. To do this, it's crucial to adopt a health-promoting diet consisting of plant-based, whole foods—fruits, vegetables, legumes, and whole grains. This, along with avoiding animal-based and processed foods, gives you the best chance at having a healthy digestive system. To understand digestive health better, I've compiled a nice list of short videos that covers the digestive system from top to bottom (literally) here - The Human Digestive Process Dissected. These videos should provide a nice foundation for you as you explore the following topics below on more specific diseases/conditions dealing with the human digestive system.